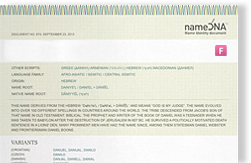 This name derives from the Hebrew name “Gavrie’l”, composed of two elements: the “gəḇar / gaḇrā” (man, strong man, hero) plus “ʾēl” (God, the God of Israel). In turn the name means “man of God, strong man of God, the power of God, God has been strong”. In Islam, he is an archangel associated with the revelation of the Qur'an. Gabriel is mentioned in the Bible once in the Old Testament and once in the New. In the Old Testament, he appears to the prophet Daniel, delivering explanations of Daniel's visions (Daniel 8:15–26, 9:21–27). In the Gospel of Luke, Gabriel appears to the Virgin Mary and to Zechariah, foretelling the births of Jesus and John the Baptist, respectively (Luke 1:11–38). The feast day of the Archangel Gabriel is traditionally celebrated by the Catholic Church on September 29 and by the Orthodox Church on November 8.